If you have been injured on a fire escape in or around Los Angeles, contact us today for a free and confidential consultation. 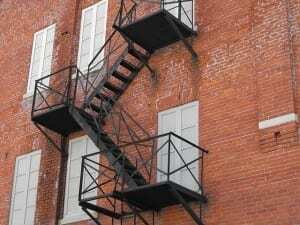 When are landlords liable for fire escape injuries? Some landlords allow tenants to use their fire escapes as an extension of their apartment. In these cases, a fire escape should be kept safe to use just like a staircase or escalator or any other part of the premises. In some cases, landlords may have a sign in place or something which says to use the fire escapes in the event of an emergency only, but it is well known that people spend time on them due to plants, ashtrays or even sofas on the fire escapes. When a landlord knows of a danger, or should have known of a danger on the fire escape, and someone is injured on it due to the landlord or property owner’s negligence or failure to warn of the dangerous condition, victims may seek to hold property owners accountable with premises liability lawsuits. Injured on a fire escape? If you were injured on the fire escape balcony, stairs, or ladder, contact us today. The call is free and we will be happy to take a look at your case. If an insurance company calls you to take a recorded statement, do speak to an attorney first, especially if there are serious injuries involved.